Specifically I am rebutting Dr. Gary Slade, who serves as professor and director of the Oral Epidemiology Ph.D. program at the UNC School of Dentistry. Gary was quoted in the aforementioned article alongside myself, making the most blatantly fallacious comments about the reality of this issue that reading them literally took my breath away. This was breathtaking because never before had I considered that I would hear a pro-fluoride argument using the same ethical logic as an anti-fluoride argument. How Slade was able to confuse and flip-flop the moral high-ground on this issue I am unsure, but I would bet money that his employer UNC has a few ethics 101 courses he could take which would point this out to him. The University of North Carolina Chapel Hill first began medicating the water supply with fluoride in Orange County by fiat in approximately 1964. In 1977, the bureaucratic Orange Water and Sewer Authority (OWASA) was formed and given control of our public water supply. They stubbornly continue pouring medicine into our water up to present day. To assert that the cessation of water fluoridation, which was decided by none of us, is “removing choice” is simply logic that is absolutely dead-on-arrival. Fluoride is an additive costing taxpayers in excess of $100,000/year. It is added by the government without the consent of the governed; why does Gary pretend it is anything less? If the city government & overzealous quacks like Slade were not so intent on medicating our drinking water, it would only contain trace levels of Calcium Fluoride, depending on geography, which is completely different than the fertilizer waste product hydrofluorosilicic acid purchased and administered by OWASA to drug all of Chapel Hill. By the way, most of this information can be gleaned from OWASA’s own documents, made publicly available on their website. Since fluoridation is a public policy done to us, the citizens, one who becomes aware of the water “treatment” can only ask questions after the fact. If those questions lead you to doubt the efficacy of public water fluoridation, what are your choices? This is a key question Slade completely fails to ask himself since the answer is yet again, the opposite of the reality he is trying to project. Why can’t Slade acknowledge that one could easily add fluoride to their non-medicated tap water if they wanted to? Like all medicine doesn’t this make the most sense? Slade also makes the wrong assumption that he and the government are the ultimate authority on what is healthy or not, shouldn’t that be left to the individual to decide? 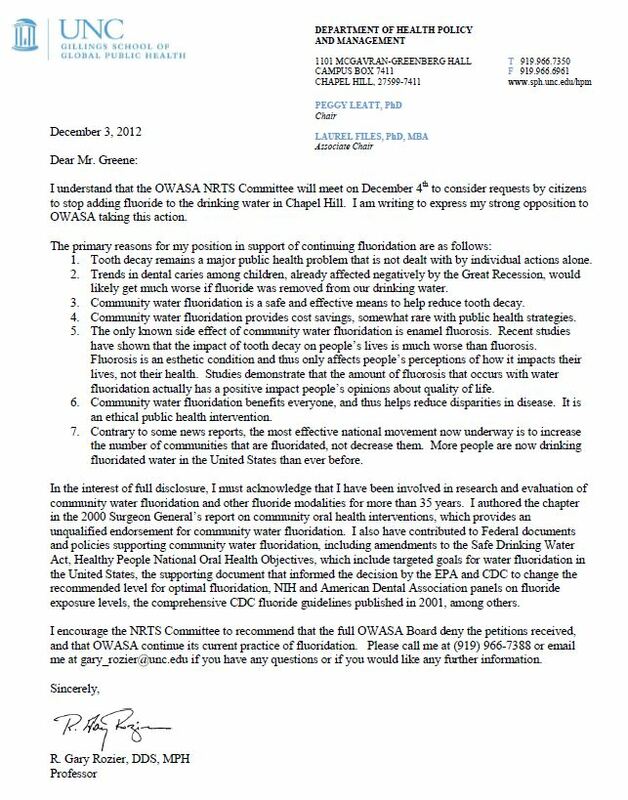 Gary implies in his statement that we all consent and agree to the stated benefits of fluoridation, when it is abundantly clear that we do not! Slade and others of his ilk believe this is not a decision you are able to make for yourself, he would rather the government make that decision for you. This is stunning for a doctor to admit in such a public manner, since an ethical doctor would uphold the right of all individuals to consent to what medicine is (or is not) added to their own drinking water. Slade’s health claims regarding fluoride only further confirm my assertion that fluoride is a drug and therefore illegally added to our drinking water. How does Slade reconcile that it has its own national drug code # 68032-383, is regulated by the FDA, and requires a prescription for dosages lower than the dose administered by OWASA per 1 liter of Orange County Public Water? Doesn’t Slade know it’s against the law to administer medicine without a proper license? Slade’s lack of knowledge on these most basic realities of the issue are exposed even further when he expands on the ridiculous notion that finding fluoridated bottled water would be “pretty much impossible” and the apparent main concern of OWASA customers, should they suddenly discover that OWASA stopped medicating their water supply. 1) It is incredibly easy to find bottled water that is fluoridated already. Is Slade not aware that most bottled water originates from municipal water sources which in the United States, are fluoridated more than 80% of the time? By contrast it is actually much harder to find truly non-fluoridated bottled water. Further to my point – many companies strangely advertise the addition of fluoride to their bottled water. 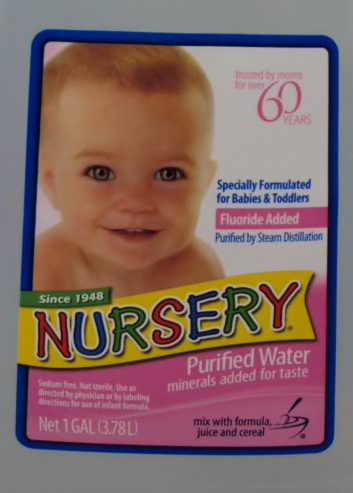 You may have seen this at grocery stores called “Nursey Water.” It is marketed to unsuspecting mothers- a fact I find incredibly disturbing. For Slade to suggest that fluoridated bottled water is even close to impossible to find is generously speaking, ignorant hyperbole. 2) It is cost prohibitive to filter out the medicine added to your tap water which in a painfully ironic way, ends up hurting worst the same class of citizens public health do-gooders are claiming to help. I know this myself, since I have had to spend more than $400 on equipment required to remove the medicine and contaminants lovingly added by Durham, a cost many would not bear. The frustrating thing about fluorosilicic acid is that a cheap Britta filter will not remove it whatsoever, which makes access to the correct filters legitimately impossible for some. The only way I have discovered over the long term to remove FSA from my tap water is with steam distillation, a time & energy consuming process that removes the water from heavier elements contained in the tap water. Unfortunately, distillation still does not even solve the problem of showering in the highly corrosive hydrofluorosilicic acid, which is absorbed through your skin & accumulates in your bones over time. It should be lucid by now, but these are not options. The citizens pay for and have the right to a public utility, water, without medication being added to it by force. How this is not evident to a professed doctor, Gary Slade, is something I hope he will be able to explain after reading this. In closing I would just like to say that since becoming an anti-fluoride activist it has been a most curious phenomenon to witness – that many of the most rabid pro water fluoridationists like Slade are dentists, even though one might expect that if fluoride worked as claimed it would put them out of business. With this in mind it was no surprise to me that Gary Slade, a dentist who teaches public health at the UNC school of dentistry, was published promoting the forced medication of all of Chapel Hill. At least in Orange County it is the University of North Carolina at Chapel Hill, Slade’s employer, the citizens have to thank for their medicated tap water in the first place. Hopefully this adds some valuable color to Slade’s comments which will help your readership understand their illogicality and offensively spurious nature. 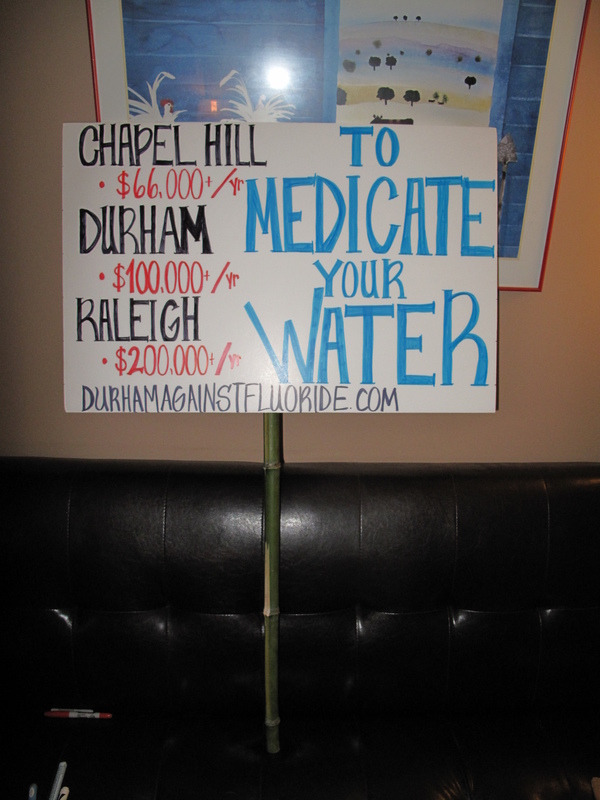 Do you live in Raleigh, Durham or Chapel Hill and want to do something about the systematic medication of our public drinking water? Then join us for a potluck lunch, discussion and planning meetup on April 20, 2013 at the Indian Creek Shelter & Playground! There are many individuals in the Triangle area who are deeply concerned about our city’s policy of systematically adding medication to our public water supply. Unfortunately even after a collective 1.5 years of protests, the city councils have not taken our complaints to heart and continue this policy despite the mounting evidence that hydrofluorosilicic acid is detrimental to our health and not beneficial to our teeth. Therefore we are coming together as a group to discuss how we can work together to affect change and force a referendum vote on this issue. Bring a prepared dish, a drink and your brain! We will share food and nice weather but also discuss this very serious issue and develop a direct action plan to achieve our goals. Help us Promote this Event by Printing & handing out the below flyers (Front and Back)!! Watch Videos of the City Council Trampling YOUR rights!